We never expected Ceasar to have puppies. It is amazing that he has got children, even in other countries in Europe and hopefully also in the far far away Australia. After waiting for 1 year to see the developments of Ceasar's puppies, we can say we are very pleased. We therefore decided to do more litters with breeders who share the same thoughts as us. Most important is the fact that the breeder gives the puppies a good socialisation and takes good care of them. These pups will need to get the best homes there are, with active people who love and understand them. The Rhodesian Ridgeback is a dog that is your friend, your partner and in case of problems your defender. It is a selfassured dog that after sufficient training can be taken everywhere. Eventhough at ease in restaurants, cities, countryside etc, for us there is nothing more enjoyable than to relax with a RR on the beach. There you can see the true ridgeback who makes funny jumps, marvelous manoeuvres and enjoys life. 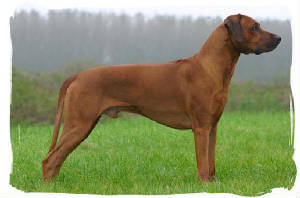 Our aim is to breed Rhodesian Ridgebacks that are companions for life.